Siemens Gamesa Renewable Energy (SGRE) today received the order for the 487 MW SeaMade offshore wind power project in Belgium from customer Seamade NV. It includes supply and commissioning of 58 units of the SG 8.0-167 DD offshore wind turbine and a 17-year Service agreement. The project consists of the two combined sites: Seastar, a 252 MW offshore wind power plant with 30 SG 8.0-167 wind turbines and Mermaid, a 235 MW offshore wind power plant with 28 SG 8.0-167 wind turbines. SeaMade NV is a partnership formed of the Otary RS NV (70%), Engie Electrabel NV (17.5%) and Eneco Wind Belgium SA (12.5%). Offshore construction is to commence in 2019 and be completed in 2020. SGRE will provide the logistics solution along with remote monitoring and diagnostics for the following 17 years in order to ensure their long-term availability and performance. “We are very pleased that our preferred supplier agreement announced in March 2018 has now become a fully confirmed order with SeaMade NV. Combining the two project areas into one project shows excellent leadership by our customer to drive down the cost of energy from offshore wind through economies of scale. We look forward to the next steps in the project, helping meet the Belgian government’s 2020 climate objectives,” says Andreas Nauen, CEO of the Offshore Business Unit of Siemens Gamesa Renewable Energy. The 252 MW SeaMade Seastar site is located 40 km off the Belgian coast, and features water depths up to 38 meters. The 30 SG 8.0-167 DD offshore wind turbines will be installed on monopiles, and supply approximately 260,000 Belgian households with electricity. The 235 MW SeaMade Mermaid site is located approximately 54 km off the Belgian coast, and features water depths up to approximately 40 meters. The 28 SG 8.0-167 DD offshore wind turbines will also be installed on monopiles. It will supply approximately 230,000 households with electricity. “I am pleased that after a successful installation of the Rentel offshore wind power plant – our first in Belgium – that we can now start our next project. 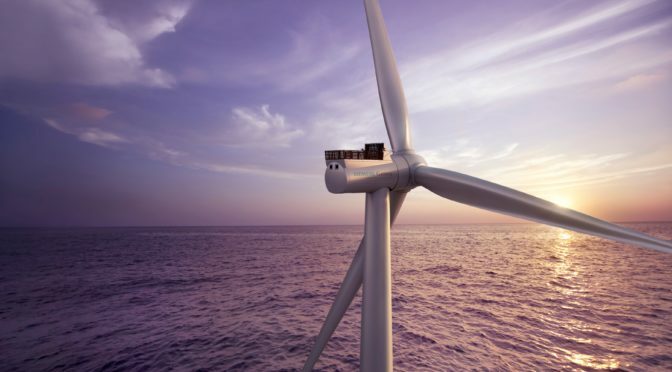 This will allow us to further expand our service business in Ostend and remain an important Offshore service player in the country,” says An Stroobandt, Managing Director of Siemens Gamesa Renewable Energy BVBA/SPRL in Belgium. The SG 8.0-167 DD offshore wind turbine has a rated capacity of 8.0 MW, and a rotor with a 167-meter diameter. It has a swept area of 21,900 m2, and utilizes the SGRE B81 blades, each measuring 81.4 meters. By 2020, more than 1,000 SGRE Direct Drive offshore wind turbines will be installed globally. In September 2018, the first SG 8.0 167 DD prototype was installed and commissioned according to plan in Østerild, Denmark. Since being introduced seven years ago in 2011, the Siemens Gamesa Offshore Direct Drive wind turbine platform has accumulated the equivalent of 450 years combined operation. SGRE has over 2,300 offshore wind turbines in operation globally with a combined capacity of more than 11GW. The company’s experiences reach back as far as 1991, when it established the world’s first offshore wind power plant. Through a strong focus on safety and innovation, SGRE constantly strives to reduce the Levelized Cost of Energy from offshore wind power.